The Sailboat Cruiser is the free monthly newsletter of sailboat-cruising.com and sets out to bring you the news, views and general musings of, well, me - a sailboat cruiser, and owner of the website. A Gybe Preventer or a Boom Brake? Are You Taking Advantage of LED Lighting? We discovered our uninvited guests after launching in Jolly Harbour, Antigua. There were two of them, a male and female - as proven in a brazen display of passion on Alacazam's foredeck. All attempts to catch them and return them to the vegetation from whence they came proved fruitless - these tree lizards, now named as Fred and Freda, were coming cruising with us. And so they did, visiting Antigua, Nevis, Eustatia, St Martin, St Barts, Dominica, and St Lucia where Fred unaccountably vanished. I thought Freda was looking a little green but otherwise showed little remorse as she continued south with us through Bequia, the Tobago Cays, Union island, Carriacou and Grenada, where we hauled out for the hurricane season. On Alacazam we like to keep things simple, practical and robust. 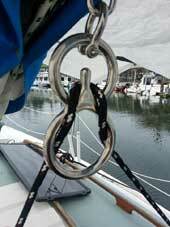 Which is why - as I just may have mentioned before - we favour a slab reefing and lazy jack system for the mainsail. 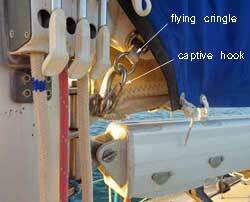 In this system, the reefing cringle on the luff of the sail is pulled over a hook fixed to gooseneck. But there is a way to avoid this - fit a 'flying' cringle. 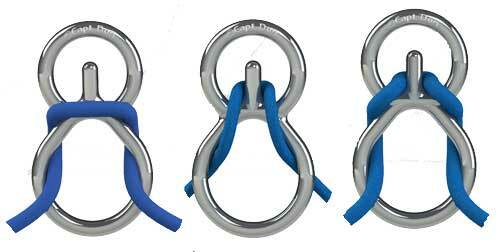 This comprises two stainless welded rings attached to each other by a short webbing strop made up through the cringle. The rings are larger than the cringle so they can't pull through. It's now much easier to locate the appropriate one of these over the hook than it would be the cringle. But it's even easier for it to fall off, which is why you need the captive hook. Gybing the mainsail in anything of a blow is something we all take seriously. Get it right, and we all allow ourselves a warm glow of satisfaction; Get it wrong and we and/or our boat can end up in serious trouble. Even worse than a controlled gybe that isn't, is an accidental gybe that no-one sees coming. 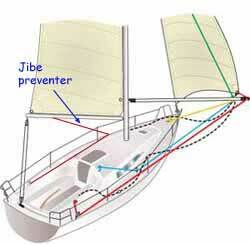 This latter scenario can be avoided by rigging a gybe preventer, a line which holds the boom forward. This works well as long as you don't let the wind get on the wrong side of the sail. If it does, you're in for a very interesting time. Clearly, uncontrolled and accidental gybes are both best avoided - which is why you need a boom brake. These have been around for years, but tend to be a bit pricey and in some cases unnecessarily complex. So I was very interested to see Capt. Don's new design as shown here on the right. Manufactured from 1/2 inch (12mm) 316 grade stainless steel and suitable for use with 8mm to 12mm rope, at $79.99 apiece they're much less expensive than other boom brakes. Yes? Me too. Their low current draw and longevity is just too much to miss out on. "Due to the low energy draw of LEDs, the gauge of wire used can be reduced. Caution: Typical incandescent fusing requirements are too robust for LEDs, so fusing must be sized for the low LED circuit draw. Incorrect fuse sizing can cause damage to your electrical system". Post-sundowner, cockpit conversation often turns to heady discussions about the sky above and 'what's out there'. Stars, planets and constellations are something we cruisers are able to recognise to a greater or lesser degree. Any bright object not showing navigation lights and moving quickly is likely to be one of the increasing numbers of satellites speeding along its orbit. Now and again you catch sight of a particularly bright one. Could it be the International Space Station? 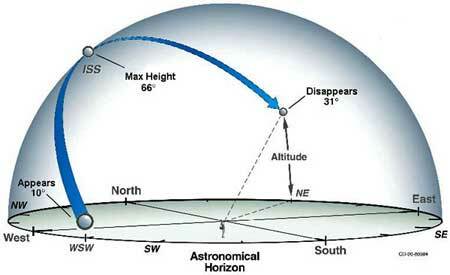 This piece of magic tells exactly where, when and for how long the ISS will be visible to us in our location. But with the tail-end of Hurricane Bertha about to assault us brutally in the next few hours, I doubt we'll see anything at all. The last time I used mine was several years ago when the GPS went down between Portugal and the Madeiran Island of Porto Santo. It wasn't a great success; the sea got up such that I couldn't distinguish between the top of an approaching wave and the horizon, then the weather closed in leaving the sun a blurry haze through the thickening cloud. I gave up and relied on dead reckoning. Fortunately Porto Santo showed up in more or less the right place. If you'd like to get your hands on one of these wonderful, historic instruments, here's one for sale. It's a 1941 Husun Sextant by Henry Hughes and Sons in a beautifully restored mahogany box, and it comes with a complete set of Air Navigation Tables.